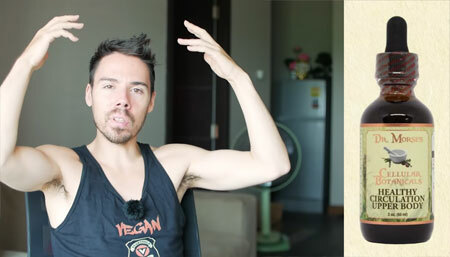 We came across a very entertaining yet informative hair loss reversal video created by a guy who goes by Vegetable Police on YouTube. 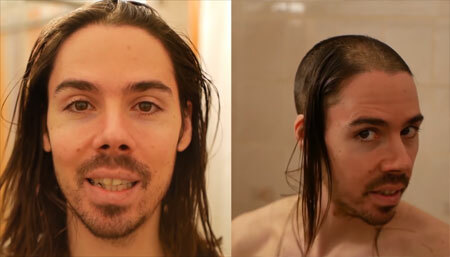 In the video, he shares his personal story of how he overcame a pattern baldness (hair thinning on top of head) and shares some interesting information and tips. Here, we will summarize a few of the points from a couple of his hair loss videos. Towards the end of the article, we will give you a summary of his action plan on what to do for thinning hair on top of head and how to reverse hair loss naturally. If you are suffering from gradual hair thinning (whether you are a female or male) or hair falling out at an abnormal rate, you will find this article very useful. His story starts with visible thinning on top of his head (typical male pattern baldness). His hair loss reminded him of a typical “horseshoe” pattern. Interestingly though, while experiencing gradual hair fall, his frontal hairline still remained intact, which made it even more awkward styling or growing his hair to a certain length. In a video, he summarizes that in order to have thick, lustrous and healthy hair, your follicles only need 2 things… in his words: “eat & poop”. Eat: He says that think of the “eat” part as your cells needing blood supply. This means that in order for each cell inside your body to be healthy, you need to supply those cells with good nutrition to work properly. Poop: The “poop” part represents the lymphatic system which is connected throughout our body. Lymphatic system plays a crucial role by filtering wastes and toxic substances. When the lymph nodes are blocked, your body (including hair follicles) is not efficiently getting rid of these unwanted substances, which then causes clogging and various diseases. So in order to reverse hair loss (or regrow hair on thinning hair spots), he first decided to switch to a fruit-based diet to cleanse his body and help with gut healing. 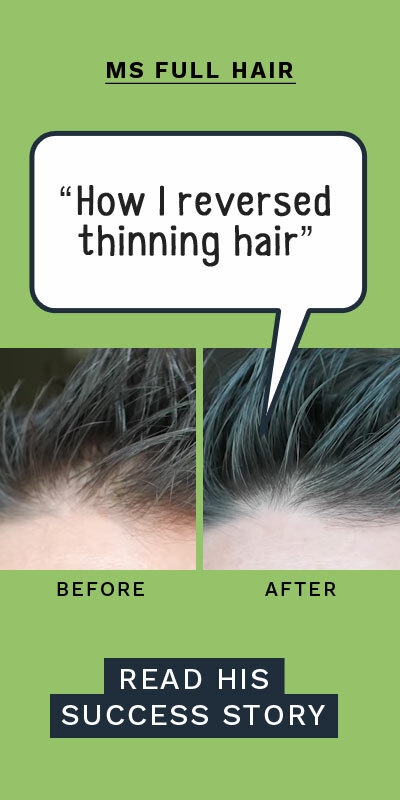 To make a long story short, an interesting side effect from this diet was his thinning hair started getting thicker again. During this diet period, he also noticed it wasn’t just the hair condition that seemed to be changing for the better, but various symptoms he had including joint pain and depression also dramatically improved as well. Can herbs help with better circulation? During his research on how diet can affect hair loss, he came across a doctor named Robert Morse who has supposedly helped people with hair regrowth. The guy from the video mentions that this “upper body circulation” concept makes total sense considering hair thinning is due to a lack of blood circulation actively reaching to hair follicles. What this tincture could possibly do is to promote active blood circulation by using the power of certain herbs. So what are these herbs? Ginkgo leaf‚ butcher’s broom root‚ gotu kola herb‚ rosemary‚ white oak bark‚ bayberry root‚ rhodiola root‚ schizandra berry‚ hawthorn berry‚ Bilberry leaf‚ prickly ash bark. You may have noticed, some of the ingredients such as ginkgo leaves, gotu kola, and rosemary leaves are regularly discussed herbs in hair loss communities for the use of stimulating healthy and thicker hair growth. NOTE: If you are not familiar with Dr Robert Morse, he is a well-known naturopathic doctor who started his practice about 50 years ago. By reading more about Dr Morse and his views on health and various diseases, we noticed that the YouTuber is explaining the summarized version of Dr Morse’s description of how our body works. For instance, his fun “Eat & Poop” analogy and instructions to consume more fruit and raw vegetables are the two crucial points Dr Morse emphasizes in many of his articles and videos. He adds that if you want to stimulate circulation to the top of head, you can do so by consuming more fruits and vegetables. 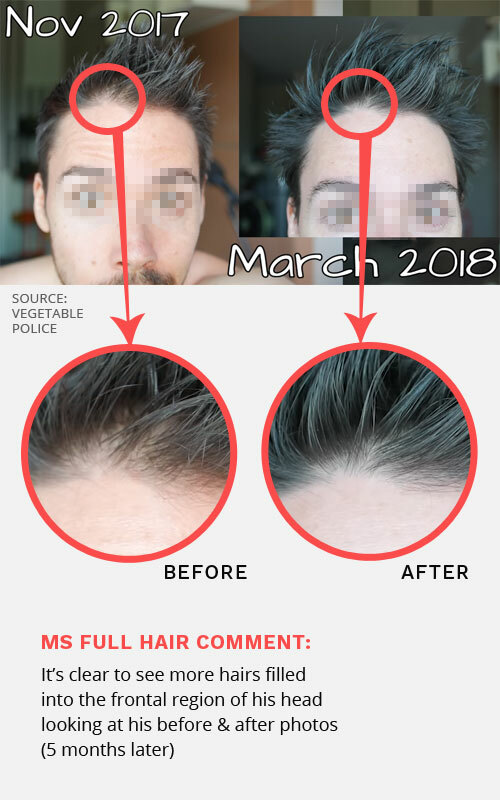 “The more raw, the better” seems to be the case (even though he wasn’t able to switch to a 100% raw vegan diet, he still experienced great health benefits including hair regrowth). In his 5-month high-fat vegan experiment, he concluded that raw fatty foods (such as nuts) seemed to contribute to a clogged-up head, even if he added a super-green juice and a large salad to his meals. During this high fat vegan diet, he experienced severe hair loss with his long hair falling out in clumps. It was so bad that when he combed through hair with fingers, clumps of hair were just falling out. NOTE: This doesn’t apply to every single person. He clearly mentions that because everyone is genetically different, this particular diet may have no negative effects in someone else’s hair (just like not every smoker gets a lung cancer). 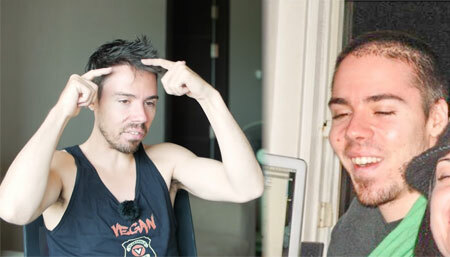 In his case, high raw fat vegan diet was the causing severe hair loss. He immediately stopped the high-fat vegan diet and went back to his normal routine – eating more fruit and vegetables. He emphasizes the importance of eating fruit throughout the videos. If you want to cleanse out the body, you need to eat more fruit according to him. When it comes to picking a fruit, he adds anything seasonal and juicier works well. He is not sure about bananas for cleansing, but juicer fruits such as melons and mangoes will work fine. According to Livestrong, raw fruit and vegetables with a high water content is great for detoxing a swollen lymphatic system. These include lemons, watermelon, and cucumber. Action items – What to do for thinning hair on top of head? He emphasizes that these steps are THE musts for reversing hair loss. Toward the end of the video, he says that a company reached out to him to try their hair products. Product #1: This company is called Regrowz and provided him a kit consisting of a herb-based shampoo, scalp stimulant, and other. He says that he consistently used the products for months and noticed some differences, but he clearly states that the products themselves are NOT going to cure hair loss unless you first make some or all of the lifestyle changes discussed above in the action items. If you are interested in trying the products, he shares a coupon code 10CAREGROWZ19 which will give 10% off from the official site. You can also buy the kit on Amazon (women and men). When we looked at the reviews about Regrowz from both US and UK amazon sites, they had similar patterns to any other hair regrowth related products. Some reviewers report that the regrowth kit didn’t do anything to their hair (and are way too expensive), while others say the opposite. Product #2: He says he also tried shampoos from Morrocco Method International. While they seemed decent overall, he couldn’t tell if the shampoos were actually helping him or not with thinning hair recovery. Plus, he adds that they are too expensive. He summarizes his natural hair thinning treatment by sharing a number of tips. His points are quite clear: Increase blood circulation to the head and prevent getting a clogged-up lymphatic system. By consuming more high water content fruit and vegetables into your daily diet as well as adding circulation-promoting herbs such as ginkgo biloba and rosemary, it can help with transforming thinning hair into thicker and fuller hair and overcoming a typical pattern baldness. We are noticing an increased number of people sharing the importance of diet for stopping any type of hair loss, whether it’s androgenetic alopecia or alopecia areata. This video was another good example of it. If your hair thinning on top or at the crown hasn’t improved even after numerous (supposedly promising) hair growth products, maybe it’s time to pay attention to inner healing first by starting with healthy diet.